One of my favorite new flowers this spring was this gorgeous upland larkspur. It is one of the purest blue flowers I’ve ever seen. 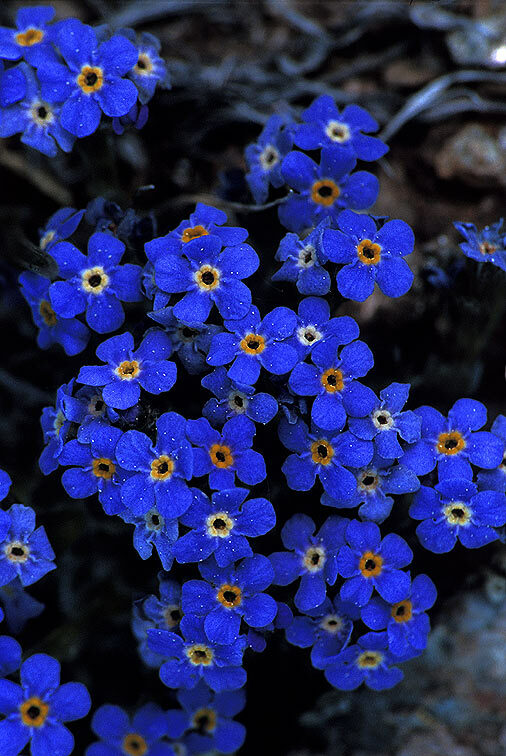 It might even rival the alpine forget-me-not, which I am slightly in love with. An old favorite of mine — the large-flowered triplet lily — was out everywhere. Since it is almost blue, this made me very, very happy. Here it is with some arrowleaf balsamroot, another perennial favorite. Another flower that was up everywhere is longleaf fleabane. This particular flower had a yellow spider camouflaged on its yellow center — hoping to catch a wayward insect — but it hid under the blossom when I bent down to take a picture. I feel bad because the flying insect on the left side of the blossom landed right after it hid — so I guess I cost it a meal. It also just wouldn’t be spring without some lupine. Here is some longspur lupine (my favorite lupine). I love that the flowers are both purple and yellow. There were some wild blackberry flowers out. You can sort of see see one berry emerging from the middle bud. I was hoping to forage them but didn’t. One of my favorite flowers this spring was this Nevada pea. The blossoms were reminiscent of a jellyfish — all translucence. I walked past field after field of them. Then thousands of sheep were herded through the Boise foothills, and they were no more. The sheep ate all the Nevada pea and larkspur even though larkspur is poisonous. They even ate some button-stage mushrooms that I was waiting to see if were the deadly poisonous destroying angel or not. I saw two other blue flowers. Here is the one — some blue lupine. It’s alright. Most of the lupine plants around Hulls Gulch were eaten by the sheep as well as far as I can tell. Here is the other — the blossoms are absurdly tiny. I have yet to ID this one. I can’t find it in any of my wildflower guides. I have four guides, so this is not for lack of trying. You start to realize that identifying tiny wildflowers involves being on your hands and knees in the dirt as people zoom past on mountain bikes or give you weird looks while hiking because what you are looking at is so tiny it looks like you are staring intently at dirt. Here is another flower I saw everywhere this spring. It is minuscule and I can’t find it in any of my wildflower guides either. It looks like tiny bells and has a single, enormous seed. I’ve looked in some guides two or three times at this point. You have to wonder if they’re not in guides because the authors don’t think people will notice them and so think there is no point, or because the guide authors don’t notice them themselves. Whatever the reason, it’s been driving me crazy. A few other new species I saw (but that I won’t show here for brevity purposes) were Columbia puccoon, miner’s lettuce, and Oregon checkermallow. I also saw several old species like Aase’s onion, Pursh’s milkvetch, sagebrush buttercup, and prairie flax.